Peak-Point Emitter Current. Ip. It is the emitter current at the peak point. It repreÂ­sents the rnimrnum current that is required to trigger the device (UJT). It is inversely proportional to the interbase voltage VBB. 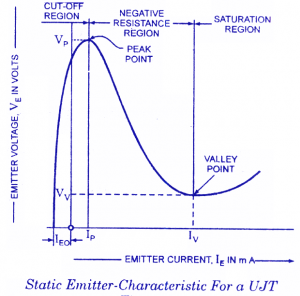 Valley Point Voltage VV The valley point voltage is the emitter voltage at the valley point. The valley voltage increases with the increase in interbase voltage VBB. Valley Point Current IV The valley point current is the emitter current at the valley point. It increases with the increase in inter-base voltage VBB. A stable triggering voltage (VP)â€” a fixed fraction of applied inter base voltage VBB. A very low value of triggering current. A high pulse current capability. VI characteristics of UJt are similar to which device? why the arrow is bended in UJT symboll? Now, is there any other interesting/creative use of UJT? Guitar amp distortion unit?